With so many pocket notebooks out there, analyzing them all takes a significant amount of time. However, because we’ve spent years testing and using various blank books, planners and notebooks, we are well equipped to guide others toward a smart buying decision. Out favorite pick among the best pocket notebooks is the Moleskine Cahier. It’s an all-around solid choice with plenty of style. However, the other entries on this list also are fashionable and functional. This is the best pocket sized notebook for numerous reasons. 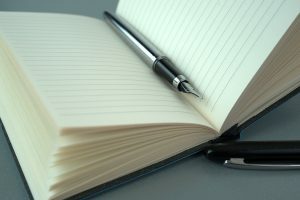 First, it is manufactured by Moleskine, a recognized authority when it comes to blank books, day planners and the like. Second, you have a choice of several options to make this an incredibly versatile product. The soft cover comes in several attractive colors. Among them are black, coffee brown, cranberry red, indigo blue, kraft brown, myrtle green and pebble grey. Each one offers plenty of style and sophistication before you even open it. On the inside, you have your choice of plain, ruled or squared paper. No matter how you prefer to take notes, one of these options should be perfect for you. Moleskin cahier journals have an incredibly slim profile, making them ideal for carrying with you. When closed, the notebook’s dimensions are just 3 1/2″ by 5 1/2″. The pages are ivory and somewhat heavy. If you use a really inky pen, then that ink may bleed through. In total, 64 pages are found in the notebook, with the final 16 of these being detachable. Loose notes may be kept in a convenient flap. This may not be the most heavy duty pocket notebook out there, but it’s still pretty durable. Its flexibility is a plus if you’re going to stash it in a pocket, and it fits nicely in virtually all purses and bags. This product deserves a description as the best pocket journal because of its genuine leather cover and rugged good looks. While it’s advertised as a travel journal, you will want to use it for anything and everything. This leather cover is designed specifically for notebooks like the Moleskine Cahier that measures 3 1/2″ by 5 1/2″. Accordingly, you can refill this handsome cover again and again with a fresh notebook. This leather bound pocket notebook gets full points for being able to stand up to tough daily use. From the office to the job site, this notebook is right at home. It’s available in black, brown and dark brown. The notebook cover comes with a notebook insert that features dot-grid paper. Also available is a zipper case and kraft folder accessory that features a zippered pouch, credit card slots and more. This beautiful cover is crafted from leather that weathers extremely well. It’s flexible too, which makes it easy to fit into all sorts of bags. Many users like that it comes with an extra elastic closure so that you can pack other things with your notebook. However, it is worth noting that using this cover does add considerable bulk to slender pocket notebooks. Adds bulk to tiny notebooks, maybe making them more difficult to carry around. This is another pocket notebook that provides you with plenty of options. Cover choices include kraft, black, orange, yellow, green, woodgrain or a combo collection. You also get to choose what kind of paper you want. With dot-grid, graph and lines to choose from, there’s something for everyone. At dimensions of 3 1/2″ by 5 1/2″, these notebooks easily fit into pockets. The flexible design is perfect for this as well. With a cover made from heavy construction paper, this pocket notebook isn’t exactly indestructible, but you can pair it with a leather cover to protect it from wear and tear. Other good news is the saddle stitching that holds the notebook together. This durable binding will likely hold up for as long as you use the notebook. The 80 gsm paper is thick enough for writing with minimal bleed-through. In fact, this is considered the best pocket notebook for fountain pen use because of its high-quality paper. However, some users dislike how dark the dots are on the dot-grid paper. They say that it makes it appear as if their notes are filled with commas and periods. A set of five pocket notebooks with pretty, colorful covers. These are available in the standard pocket size of 3 1/2″ by 5 1/2″, but you also may choose a slightly larger 5″ by 8″ size. Each notebook has 24 sheets for a total of 48 pages. This offering from Elan Publishing is notable for each notebook featuring a unique cover. With designs including fashionable florals, stripes and dots, these are notebooks that any stylish woman will use with pride. Each notebook is fastened by staples rather than stitching, which some people may see as a drawback. Nonetheless, these notebooks tend to lay flat nicely for writing. If you are looking for small pocket notebooks that are totally stylish and a great deal, then you may love this product from B-THERE. Each set features a total of 12 notebooks with lined pages. Three each of four different cover styles are included. In one set, you get covers with a variety of geometric and floral patterns. Another set has notebooks with motivating and inspirational sayings on the covers. These may be just what you need to keep yourself going on busy days. These notebooks are even smaller than the standard pocket-size as they measure just 3 and 1/4″ by 5 and 1/4″. Accordingly, they are easy to slip into the smallest pocket in your clothing or in that tiny pocket inside your purse. These covers have a definite feminine flair, so get ready to show your soft but determined side. The stitched binding is a high-quality touch in a product that costs about one dollar per item. However, some users have noted that if one page is torn out of the notebook, it may loosen most of the others. People who expect to be able to occasionally remove a page from a pocket notebook without disturbing the remaining pages may want to look elsewhere. If you are looking for a truly durable pocket notebook, then this hardcover edition may be the right one for you. True, it is a bit difficult to put this one in a pocket because it will not conform to the contours of whatever body part it lies against, but some people prioritize having a hardcover because it’s easier to write on or provides extra durability. This pocket notebook features 192 pages of 100 gsm acid-free paper. The lines are college ruled, and with paper that thick, ink is unlikely to bleed through. The cover is black and made from good-quality faux leather. An elastic binding keeps the cover closed while a ribbon bookmark makes it easy to find your place. A set of labeling stickers is included with the notebook. Also notable is the 100 percent, lifetime guarantee. If you do not like this stitch-bound notebook for any reason, you may always ask for your money back. One of the most frequent complaints coming from users of this product is that it does not lie flat when opened, which may be a deal-breaker for some people. Compared to the other entries on this list, this set of six notebooks is rather unusual. They have a plain, light-brown kraft cover. Also on the cover is the manufacturer’s name, Portage, and the date the company was established. What also sets these notebooks apart from the rest is their size. In fact, they are available in two sizes. One is the standard pocket size with the typical binding on the side. The other is a smaller notebook, which the manufacturer refers to as “tactical.” The dimensions are just 4.6″ by 2.8″, so they fit in almost anything. Moreover, these notebooks are top bound to be flipped up and open. Each notebook is bound by staples for the ultimate in flexibility. Some users say that the paper is not particularly good quality. In fact, it is quite thin, so you may have issues with ink bleeding through. For many people, pocket notebooks are an indispensable accessory. This means it’s wise to reflect on your needs before purchasing. Most pocket notebooks have soft, flexible covers. This means that they can easily slip into and out of pockets. Additionally, they conform to whatever space they occupy, so it’s comfortable to have them in your pocket. However, a soft-cover notebook may not be as durable. Also, it doesn’t provide a stable surface for writing. This is why some people prefer hard covers. If you like the idea of flexible cover but want to ensure durability, then it’s sensible to purchase a leather cover. This prevents wear and tear, and it also provides more stability for writing on the go. Give some thought to what sort of notes you want to take and whether or not you’ll be using your notebook for sketching or other purposes. Notebooks may have paper that’s lined, dotted or graphed. Which style is most suitable for your purposes? Also of great importance is the quality of the paper inside the notebook. Thin paper makes for a lighter, slimmer notebook, but ink may bleed through the pages. If you like to use both sides of every page, then you probably need thicker paper. With this list of the best pocket notebooks, you are ready to decide which product is right for you. Spend a bit of time reflecting on how and where you plan to use your pocket-sized notebook before making a purchase. This will largely determine which of these items is right for you.